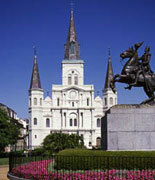 The Ghosts and Spirits Walking Tour of New Orleans is a great spooky activity for the family. The tour guides are informative about the details of New Orleans’ haunted history and the histories of the infamous ghosts themselves. They will tell you all about the ghosts, spirits, and dark history of some of the most haunted places in the city. A lot of the haunted locations along the 2 hour long tour have been featured on television shows. The tour meets at the Jackson Brewery. The tour guides take guests to the Bourbon Orleans Hotel, which has been a theater, a ballroom, an orphanage, and a convent, so it has had its fair share of creepy activity. The French Quarter is a great spot for a walking tour, especially one this eerie. The tour guides talk about Pere Dagobert, a church priest with a lovely voice, who is said to have left quite a lasting impression on the rain. The tour also takes guests by haunted houses and taverns while the guides tell stories about each location. If you are in New Orleans in October, the tour is a great way to spend an evening and get to know the city in a unique way.